I’m now safely home after attending the Society for Marine Mammalogy’s biennial conference in Halifax, Nova Scotia. It was an amazing eight days of conference talks and workshops, interspersed with plenty of networking. As well as meeting lots of interesting new people, it was particularly wonderful to catch up with so many old friends. Totally worth the 35hrs of one-way travel and 12hr time difference jetlag! I’m currently preparing a detailed conference report for the Journal of Animal Ecology’s blog, but in the meantime I wanted to make my conference presentation available online. To download a PDF version, click here. The full abstract is provided below. Feedback welcome! Marley, S.A., Salgado Kent, C.P., Erbe, C., Parnum, I.M. and Parsons, M.J.G. As human activities continue to expand across the marine environment, anthropogenic ocean noise is also rapidly increasing. This is of concern to acoustically-specialised species, particularly those displaying a high degree of habitat overlap with anthropogenic activities, such as bottlenose dolphins (Tursiops sp.). There is a need to describe the soundscape of coastal dolphin habitats and examine how prominent anthropogenic noise sources may impact these animals. The Swan River in Western Australia flows through the state capital of Perth, containing over 1.4 million people, and consequently experiences a range of anthropogenic activities. However, the river is also extensively used by a resident community of Indo-Pacific bottlenose dolphins (T. aduncus). 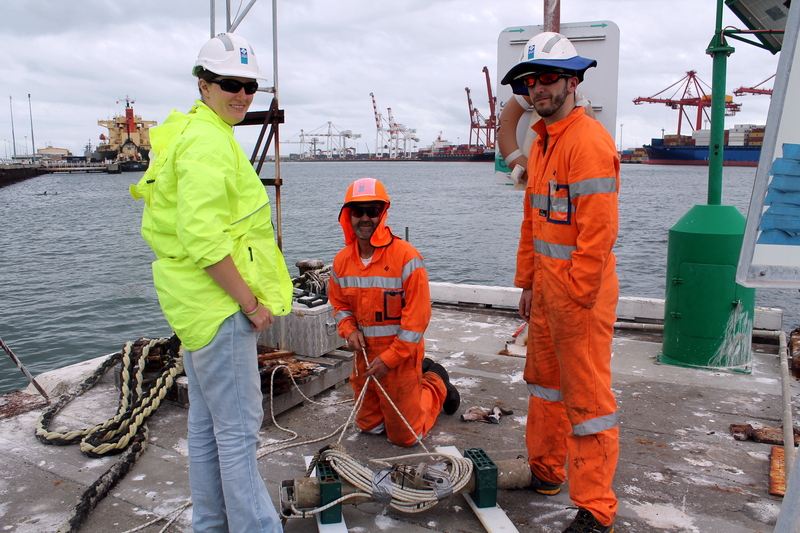 Autonomous underwater acoustic recorders were used to collect data throughout the Swan River, which were analysed via weekly spectrograms, power spectrum density percentile plots, octave-band levels, broadband noise levels, and generalised estimating equations. Land-based theodolite tracking at two sites provided information on vessel traffic and dolphin behaviour, which were assessed using generalised additive models and Markov chains. Acoustic datasets collected from 2005 to 2015 indicated that the Swan River was comprised of multiple acoustic habitats, each with its own characteristic soundscape and temporal patterns in underwater noise. The ‘noisiest’ site from an anthropogenic perspective and in relation to dolphin communications was the Fremantle Inner Harbour (mean broadband noise level: 106 dB re 1 µPa rms [10 Hz – 11 kHz]). Theodolite tracking at this site found that dolphins remained present during periods of high vessel traffic. However, behavioural observations indicated significant alterations to dolphin movement speeds and activity states at high vessel densities. Furthermore, whistle characteristics varied in conditions of high broadband noise. 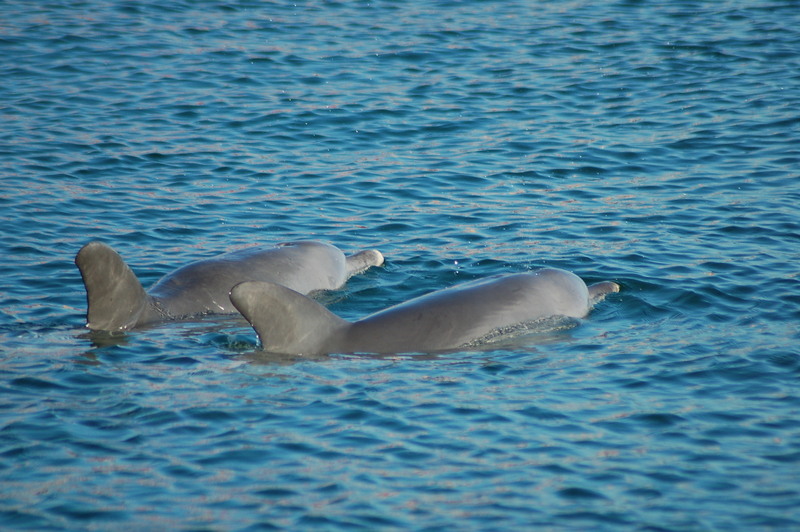 This work suggests that dolphins maintain occupancy at key foraging sites within the Swan River despite the presence of vessels, but alter their behaviour in periods of high vessel traffic. This entry was posted in PhD Life, Research, Science Communication, Soundscapes, Underwater Acoustics, Whales and Dolphins and tagged Acoustics, Canada, Conference, Dolphins, Marine biology, Marine Mammal Science, Nature, Science, Soundscapes on November 10, 2017 by Sarah Marley. I am a little bit behind in posting about my various PhD publications. 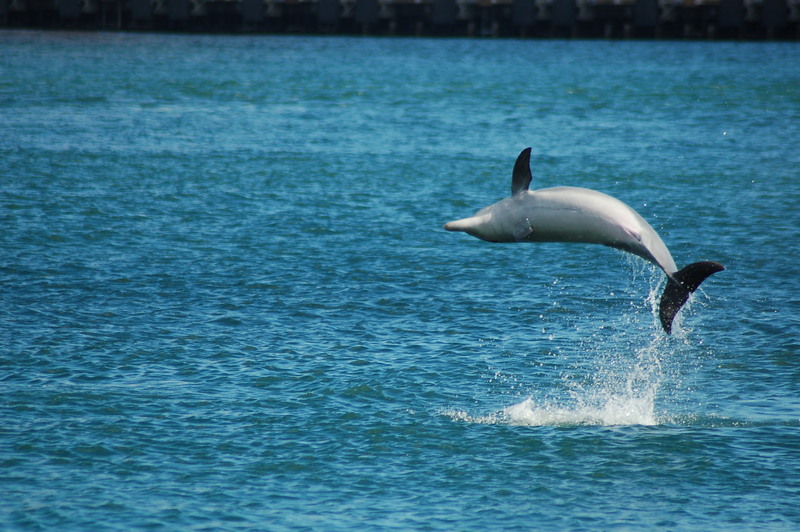 But a pretty cool one that came out in the August edition of Acoustics Australia focused on comparing the acoustic characteristics of urban versus pristine coastal dolphin habitats. I’ve previously spoken about the need to define the soundscape of dolphin habitats and examine patterns of when and where noise occurs. But whilst we can monitor dolphin acoustic habitats and describe how they are now, in many cases it is hard to say how they were in the past. We simply don’t have enough long-term datasets that capture the expansion of human activities into the marine environments – i.e. datasets that go far enough back in time to capture when the habitat was pristine and free of human influence. Understandably, this can also make it hard to decide how we best manage man-made noise in these habitats into the future. It’s hard to determine what noise mitigation measures are necessary when you don’t know how quiet an area is ‘supposed’ to be. A potential solution to this conundrum for managing ‘urban’ areas is to find comparable ‘pristine’ areas which are also used by the study species, and see what differences exist. Of course, this is reliant upon pristine areas still existing in the first place. However, in Western Australia we are fortunate enough to have some areas up in the remote north of the state. The Kimberley region in north-western Australia is one of the most remote, pristine wildernesses in the world. The largest town in the region is Broome, which has a permanent population of only 16,000 people (although the temporary population can increase to 45,000 in the tourism season). Broome is located on the shores of Roebuck Bay, with a relatively large population of snubfin dolphins and is also regularly used by bottlenose dolphins and humpback dolphins. This area offers a nice contrast with the busy, urban environment of the Swan River, which flows through the Western Australian state capital of Perth. This river is also used by bottlenose dolphins. To create successful noise mitigation strategies for coastal dolphins, there is a need to compare ‘quiet’ and ‘noisy’ acoustic habitats. Roebuck Bay and the Swan River offer the perfect opportunity to do just this. I chose to compare the pristine soundscape of Roebuck Bay with the Swan River’s anthropogenically-noisiest site, the Fremantle Inner Harbour. I used autonomous underwater acoustic recorders to monitor the soundscape at these sites, and assessed these using a combination of weekly spectrograms, power spectrum density percentile plots and probability densities, octave-band levels, broadband noise levels, and generalised estimating equations – i.e. a shedload of nifty acoustic analyses. What these essentially showed were that these two sites are very different in their acoustic characteristics. In Roebuck Bay, biological sounds (such as crustaceans and fish) were the most prevalent sound sources, with very few instances of vessel noise. However, in the Fremantle Inner Harbour, man-made noise dominated. This worked out to a 20 dB difference between sites on average, and the frequencies used by dolphins for communication were more likely to be masked in Fremantle Inner Harbour based on elevated noise levels. In this study, I was also lucky enough to get some acoustic recordings of sounds produced by snubfin and bottlenose dolphins in Roebuck, and could use these for a comparison with the sounds produced by bottlenose dolphins in Fremantle. This helped me to discuss the potential consequences on Roebuck Bay dolphins if noise levels were to increase at that site. Such information is going to be useful going into the future, as several coastal developments are currently planned for Roebuck Bay. To find out more, check the paper out online or contact me! This entry was posted in Research, Soundscapes, Underwater Acoustics, Whales and Dolphins and tagged Acoustics, Anthropogenic impacts, bottlenose dolphins, Fremantle, Kimberley, Marine biology, Nature, Noisy Ocean, Snubfin dolphin, Swan River, Western Australia on October 23, 2017 by Sarah Marley. Last night, my sixth (and final) PhD paper was published in the journal Scientific Reports! In earlier papers, I established that the Swan River is a pretty noisy place. One of the noisiest sites from an anthropogenic perspective is the Fremantle Inner Harbour, which experiences high levels of vessel traffic. However, during my initial visual observations I discovered that dolphins continued using the harbour, even though it was a busy noisy environment. So in this latest paper, I searched for evidence of dolphins responding to boats and noise at a subtler scale. To do this, I used a combination of visual and acoustic monitoring techniques. I found that dolphins significantly increased their movement speeds when vessel traffic occurred at high levels. Similarly, dolphins also changed their behavioural budgets at high vessel densities, spending more time travelling and less time resting or socialising. I also looked for acoustic responses, by measuring nine characteristics to describe the shape and frequencies of dolphin whistles in different noise scenarios. I found that all nine of these characteristics varied with increasing levels of broadband noise, and that the response was particularly strong for low-frequency noise. I’ve spoken before about the importance of scientific publishing, in terms of career brownie points for researchers. So I’m pretty chuffed to have completed publishing my PhD! To view the full list of papers from this and other projects, check out my Publications page. Now to deal with all the ‘leftover’ PhD data that I collected, but didn’t get around to including! 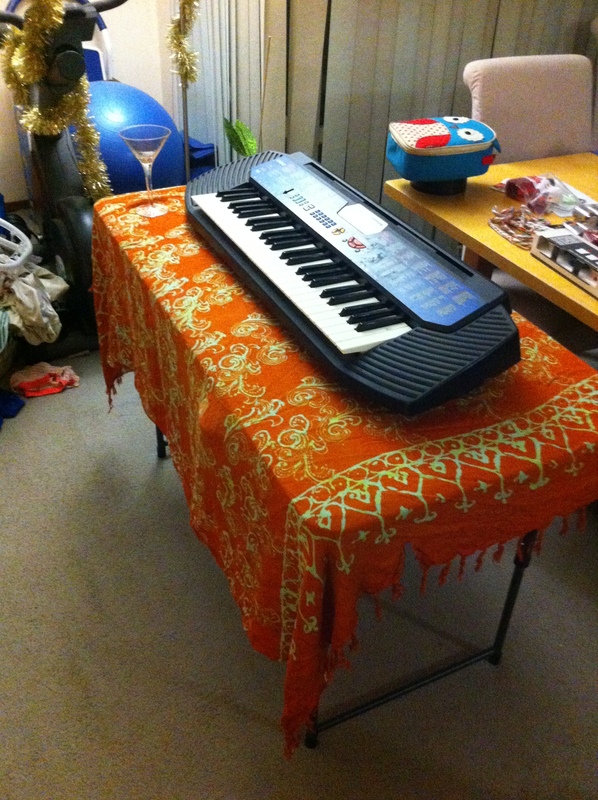 This entry was posted in Academia, PhD Life, Research, Underwater Acoustics, Whales and Dolphins and tagged Acoustics, Animal Behaviour, Anthropogenic impacts, bottlenose dolphins, Conservation, Dolphins, Marine biology, Nature, Noisy Ocean, PhD, Research, Science, Swan River, Western Australia, Wildlife Film-making on October 19, 2017 by Sarah Marley. There is a growing awareness of underwater noise in our oceans and the potential impacts of such noise on marine life, an issue which was the major theme of my PhD thesis. This is particularly relevant for “acoustically-specialised” species, such as dolphins. However, before we can start investigating the effects of noise on these animals, we first need to define the soundscape of dolphin habitats and examine patterns of when and where noise occurs. This description of noise in dolphin habitats formed my third PhD chapter, which has now been published online in the scientific journal Frontiers in Marine Science. In this paper, I examine spatial and temporal variability in the soundscape of the Swan River using over 11,600 hours of acoustic data collected from five sites within the river system across eight years. Multiple sound sources were recorded at these sites, but the prevalence of these sounds at each site differed, giving each location a characteristic soundscape. Consequently, some sites were ‘noisier’ than others. Marley et al. (2017) Spatial and temporal variation in the acoustic habitat of bottlenose dolphins (Tursiops aduncus) within a highly urbanised estuary. Frontiers in Marine Science, 4: 197. And watch this space, as the remaining three PhD papers should be going up online in the next few months! This entry was posted in Research, Underwater Acoustics, Whales and Dolphins and tagged Acoustics, Anthropogenic impacts, bottlenose dolphins, Marine biology, PhD, Research, Science, Swan River, Western Australia on July 15, 2017 by Sarah Marley. As well as working on my PhD, I’m also lucky enough to be involved in other projects at the Centre for Marine Science and Technology (CMST) from time-to-time. Now the results from one of these projects have been published in the ICES Journal of Marine Science. 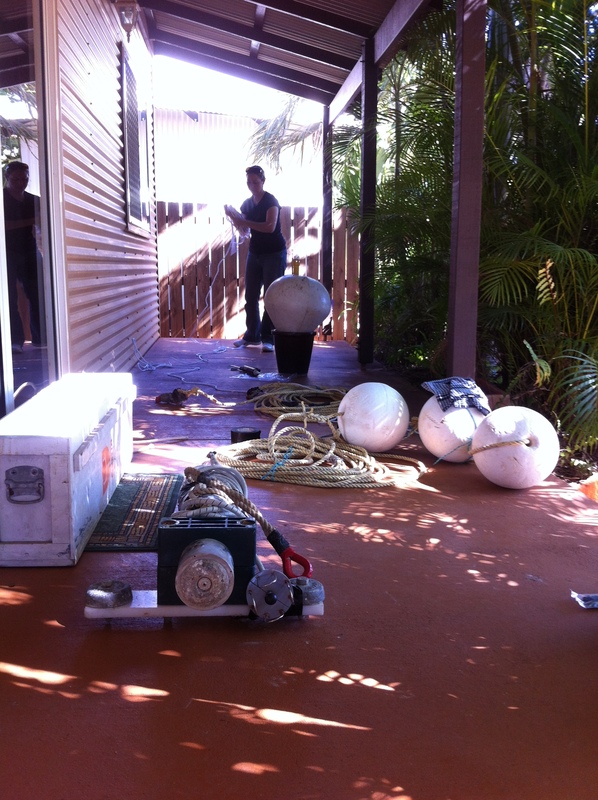 A couple of years ago, I was asked to review acoustic data from Darwin Harbour, in the Northern Territory of Australia. I’ve written before about the variety of sounds produced by fish, and in the Darwin data we found oodles of different fish choruses. Fish sounds can be species and size specific, and such en masse sound production often has behavioural associations, for example by corresponding with feeding or reproduction. So there is a lot of information to be gained by listening in on fish! In this paper, we recorded nine different types of fish choruses and investigate their patterns of occurrence. Environmental conditions such as lunar patterns, time of sunset, temperature, tidal information and salinity levels all contributed to the context of when particular choruses were heard. These results are useful not only to scientists but also to fisheries managers, as it provides improved knowledge regarding species distribution, fish habitat-use, identifies spawning seasons, and monitors behaviour. Which, when you can’t see fish below the surface, is often difficult data to collect! The full paper (doi: 10.1093/icesjms/fsw037) is available here. This entry was posted in Research, Underwater Acoustics and tagged Acoustics, Biology, Darwin, Fish, ICES, Marine biology, Nature, Science on July 9, 2016 by Sarah Marley. After months of graft, I’m extremely chuffed to announce that my first PhD chapter has now been published online! To view the full article, please visit the Springer website. If you have any issues, please contact me. One down, one draft on supervisor’s desk, and three more to go! 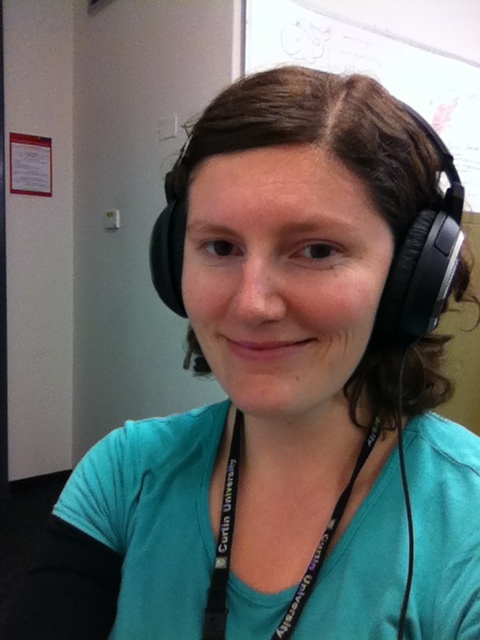 This entry was posted in PhD Life, Research, Underwater Acoustics and tagged Acoustics, PhD, PhDWin, Research, Science, Soundscape, Swan River, Western Australia on January 10, 2016 by Sarah Marley. My last post spoke of my experience competing in the WA State Heat of FameLab. Although I was delighted to be voted the Peoples Choice by audience vote, unfortunately only the winner and runner-up of each state heat progress to the National Final. But a couple of weeks after the State Heat, I received a phonecall from FameLab Australia organiser Chris Hodge, inviting me back to present again as the British Council Wildcard entrant. So I made it to the Final by a fluke! 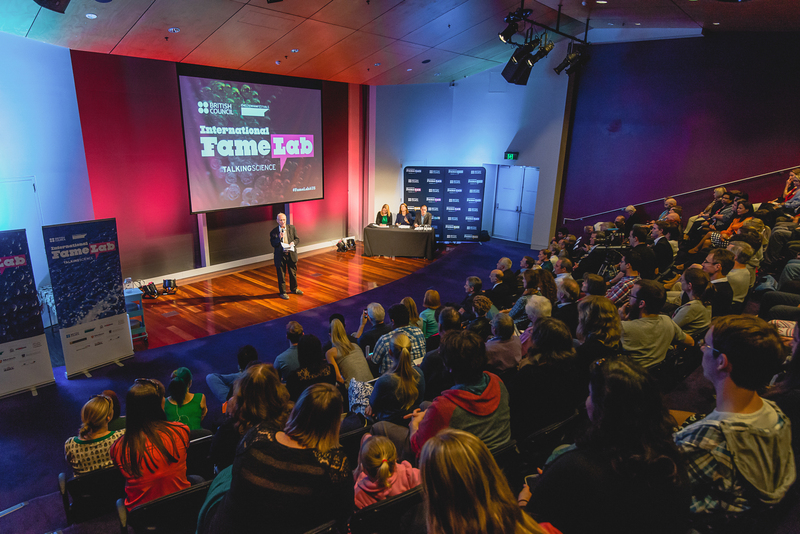 The FameLab Australia Final involved entrants from New South Wales, Victoria, ACT, Queensland and Western Australia. A mix of PhD students, post-docs, and scientists-with-real-jobs we covered a range of subjects from coughing guinea pigs to spider behaviour, gut bacteria to brain function, biofuel to artificial intelligence. A mysterious group of people at the best of times, especially when most of us had never met before! I had the chance to suss out one of the competitors, David Farmer, on a radio interview with ABC Melbourne presenter Lindy Burns. Ironically, when discussing the Australian competition, the station had managed to select two Scottish people to interview. So this combined with dolphins, lasers and squishy brains made for some great banter in a pretty unique interview! The lead-up to the National Final included two days of media training with science communication guru Malcolm Love. Chief Trainer of FameLab International, Malcolm was originally a freelance journalist in South America before working for the BBC as a producer on features and documentaries for over 20 years. He is now a specialist in the public engagement of science, giving lectures on the subject at the University of West England and providing training for a range of science-stakeholders, as well as hosting his own weekly radio show “Love and Science“. So this guy knows what he’s talking about. In the training, we covered a variety of topics including body language, story-telling and interview tips. But one of the best things about it was interacting with people who love science communication. Many scientists still hold onto a fear of presenting to the public, and worry about “dumbing down” their research or coming across as boring. But all the participants were obviously people who were passionate about their research, and it is hard not to get swept up in that kind of enthusiasm! So it was an awesome two days of being a science geek with other science geeks and discussing how to turn other people into science geeks too! A sell-out event with over 200 people in attendance, the final was a bit more nerve-wracking than the state heat. But I always tell presenters that you just have to try changing the nervous energy into excited energy, so when I stepped up to the spotlight I tried to remember my own advice. Unfortunately, I still felt my performance lacked the right mix of enthusiasm – even as I was speaking, I knew it sounded over-rehersed. So although the crowd laughed in the right spots and seemed keen, I knew it wouldn’t be a winning presentation. But that’s okay – there will be others! 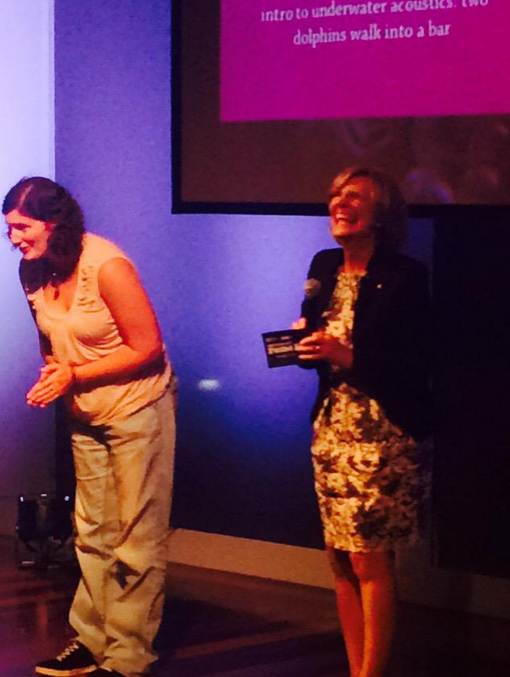 The overall winner of FameLab Australia 2015 was Dr Sandip Kamath, with Dr David Farmer coming a close second. Sandip is studying shellfish allergies at James Cook University, and spoke of his ambition to help people overcome these reactions – with the help of Mr Pinchy the lobster, his side-kick slash prop. David moved away from squishy brains and lasers to give a fascinating description of his research at the Florey Institute of Neuroscience, investigating the cough reflex and brainstem function. To see photos from the night, check out the British Council Flickr Page. And, of course, we all had fun celebrating at the FameLab after-party! The official function was in the WA Maritime Museum, with some speeches and lots of well-wishers… But the scientists and British Council crew headed out into Fremantle to celebrate afterwards! After all, we’re twelve of the top young science communicators in the country! So now, as Sandip flies to the UK to compete in the FameLab International Final at the Cheltenham Science Festival, for the rest of us it is back down to Earth. I’m back in a world of fieldwork, marking student assignments, and desperately trying to finish the first scientific paper of my PhD. I can see all my new sci comm pals talking about the same reality bump on Twitter. But to be honest, getting back to research is quite exciting enough… for now! 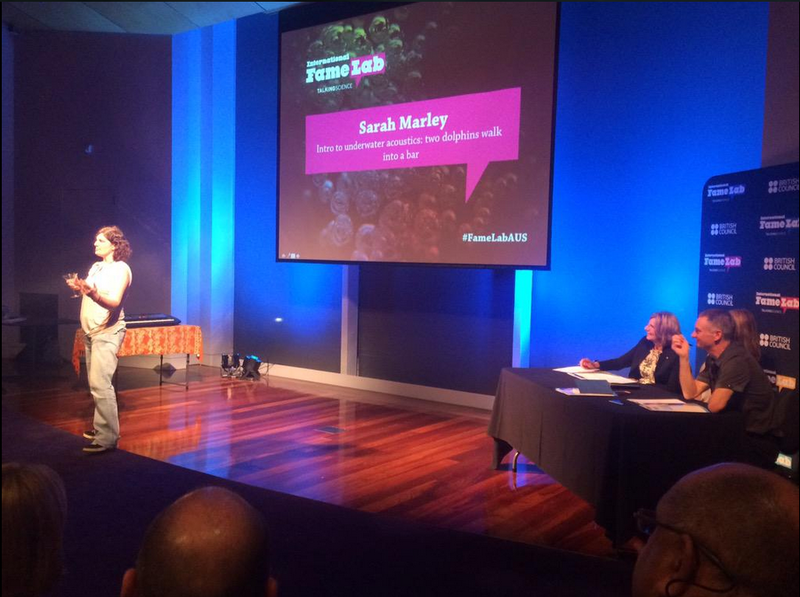 This entry was posted in PhD Life, Science Communication, Underwater Acoustics, Whales and Dolphins and tagged #famelabaus, Acoustics, Australia, British Council, Curtin University, Dolphins, FameLab, Marine biology, Nature, Noisy Ocean, PhD, Research, Science, Science Communication, Western Australia on May 24, 2015 by Sarah Marley. One of the things many scientists find challenging is how to explain their research in an interesting manner. It’s one thing preparing your research for academic publications – there is a recognised structure to follow, certain items to always include, and feedback from co-authors and reviewers to improve your writing. But presenting that same information to the general public is a whole other ball game. How do you keep a class of undergraduates interested for a whole 2hr lecture on underwater acoustics? How do you encourage community volunteers to develop scientific thinking skills? How do you explain your research to media personnel in a way that makes it exciting and worth sharing? These are problems that I find really interesting. Obviously traditional science communication (academic publications and presenting at scientific conferences) is important. But I’ve spoken before of the importance of also becoming a virtual scientist, and learning new science communication techniques to promote your research. 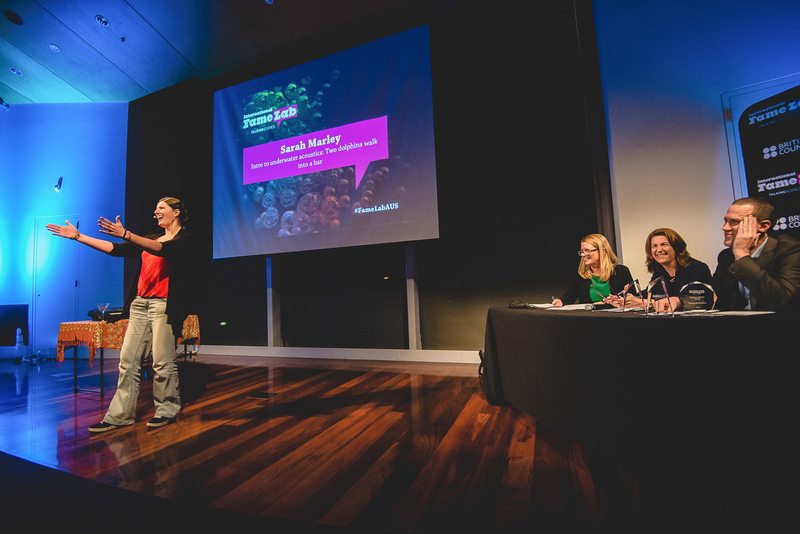 So I was pretty chuffed last week to find myself at a day-long workshop on “Science Communication and Presentation Skills” as part of FameLab Australia. 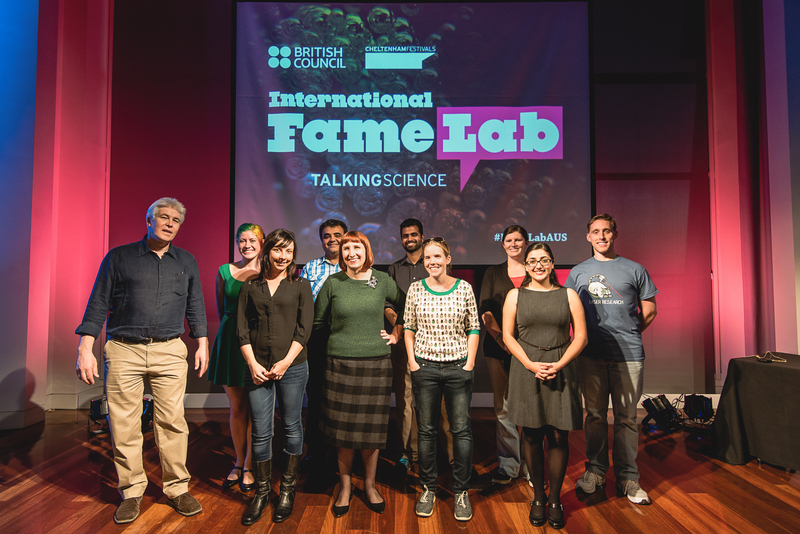 FameLab is one of the world’s leading science communication competitions. It aims to get people “talking science” by mentoring young scientists and engineers to turn them into awesome communicators. Similar to the 3-Minute-Thesis Competition (3MT), speakers are given only 3mins to explain their area of research – no powerpoint, no labcoats, no jargon! 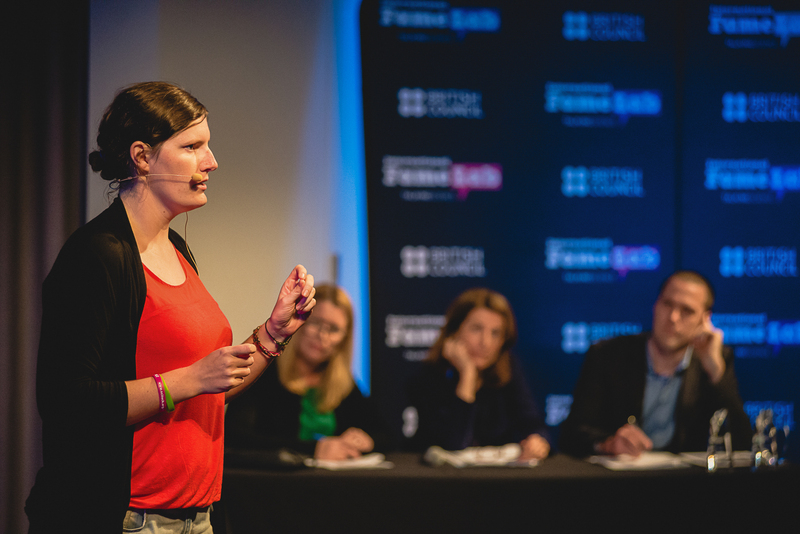 Organised by the British Council, there are over 45 countries participating in the event, having their own national finals to determine their competitors for the final FameLab International Competition in the UK. I was encouraged by Curtin University to enter, so went along last Thursday to the workshop, which culminated in the WA State Finals that evening. The workshop was held by three local science communicators – Emma Donnelly (Science Outreach Coordinator; Curtin University), Sarah Lau (Communication Managed; ChemCentre), and Renae Sayers (Theatre and Events Coordinator; Scitech). We spent an amazing day bouncing around between flaming hands, personal brands, communication platforms, and vocal toolboxes. It was like a step back into my former Science Presenter life… If I could find a way to incorporate explosions, liquid nitrogen, and / or flaming limbs into my dolphin presentations, I would be complete! For my talk, I really wanted to get people thinking about underwater soundscapes. To do this, I wanted to use an example that people could relate to – and since I knew my audience would majorly consist of young to middle-aged adults, I figured comparing the underwater environment to a bar would be a pretty nifty metaphor! Almost everyone in the audience had probably experienced the masking effects of background noise in a pub at some point, so it nicely familiarised the problem faced by dolphins. How do a keyboard and a martini glass explain underwater noise? But how to illustrate this on stage? FameLab requires the use of a prop, which I struggled with for a while. I got a friend to record some bar sounds from his weekend exploits, but playing them on stage quickly became a logistical pain. 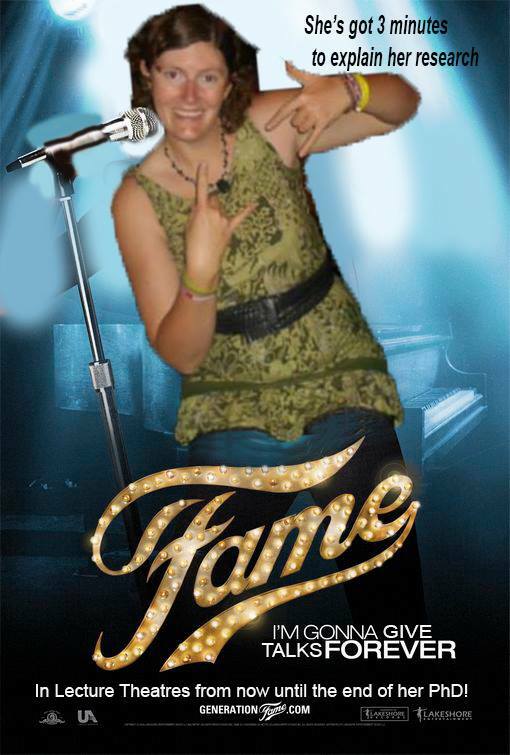 The rules didn’t allow me to use the FameLab sound system, and bringing my own wasn’t feasible. But a brainwave on the treadmill (I often problem-solve whilst walking) reminded me of the last time I was babysitting. Owen wandered over to the electric keyboard, switched it on, and pressed the ‘random filler’ option to churn out some beats before dancing around in circles for ten minutes. Random cheesy filler music would make a great bar-sounds alternative – loud enough to make the point, whilst being tacky enough to be funny. Win! The resultant talk wasn’t filmed as part of FameLab, but Phil managed to catch the talk on his phone. The volume is a bit low, but still gives a pretty good video of my performance! I was delighted to be awarded People’s Choice by audience vote, but unfortunately I didn’t make it through to the Australian Finals. The judges consoled me afterwards by saying that it was my lack of results rather than my performance which hindered my progression to the next round, and strongly encouraged me to come back next year. Although, as a friend kindly pointed out, it means I got the votes of 200 audience members as opposed to 3 judges! Regardless, I still enjoyed the whole experience! I always enjoy the chance to talk about dolphins and get people excited in science! And it was a wonderful opportunity to meet some fellow science enthusiasts whilst flexing my science communication skills. Plus applause isn’t something you get often in research, so that was pretty appreciated! A massive congrats go to Amber Beavis (WA Museum) and David Gozzard (UWA) who were the winner and runner-up for the WA competition. I can’t wait to see you guys at the Australian final down at Fremantle in May! This entry was posted in PhD Life, Science Communication, Underwater Acoustics, Whales and Dolphins and tagged #famelabaus, academic publications, Acoustics, Biology, bottlenose dolphins, communication, Conservation, Curtin University, Dolphins, Marine biology, Nature, Noisy Ocean, PhD, Research, Science, Science Communication, Snubfin dolphin, Western Australia on April 18, 2015 by Sarah Marley.